Festivals are happening all over the United States this year. Temporary cities and large group gatherings pop-up almost overnight in music and art festivals. That's where these tents come in. Withstanding high winds and functioning as a shelter many more Kodiak tents pop up each year. 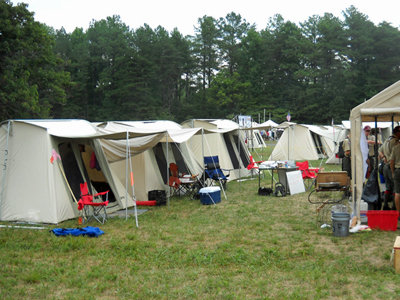 These tents listed here are our most popular for festivals since they have plenty of windows and are water-tight. So enjoy your pioneer, religious, film, and other cultural festivals in comfort and confidence. Anybody who knows canvas camping knows that Kodiak is the top of the top of the line when it comes to canvas tents. Nylon tents are cheap and a dime-a-dozen, but rarely make it through a strong storm. Many nylon campers wake up wet and cold with fogged up car windows full of those who abandoned camp. Kodiak holds up to high winds, keeps out water, and zips up closed to keep out fine dust particles. 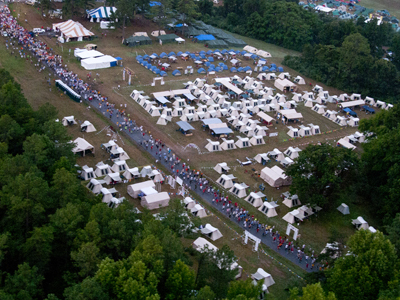 In several recent natural disasters, charitable organizations sent hundreds of Kodiak Flex-Bow tents across the world as shelters designed to live in temporarily for up to 1 year. It began with the earthquake in Haiti when the LDS church sent many tents to house the victims of the earthquake. That illustrates just how durable these are - the last camping tent you'll ever need to buy. In Utah, a Cabela's Sporting Good store kept a tent up on display in the parking lot for close to one year to impress customers and to prove just how rigid these are. It did not disappoint. While we don't recommend extended-usage with these tents it does bring comfort to know just how top-notch these are. Smaller competitors have popped up and have come and gone over the years. Why? Because they cut corners, used an inferior material, created seams that pool water, and offered no customer support. Why buy from Competitive Edge? Fast shipping ensures you don't have to wait weeks or months for delivery like our competitors. Ships Out Same-Day when ordered in the morning. Expert customer service reps to help you make the right choice.